This website was put together using various resources. The following information should help thoses that would like to use this page as a reference in school reports or other resources. How do I add this website to my biography? 1. cryan.com. "Gulf War" http://www.cryan.com/war (25 Apr. 2019). Where did you find the information on this website? Various types of resources. I basically went to the Boston Public Library and read newspapers and books related to the Gulf war. These papers included, The Boston Globe, The Boston Herald, and USA Today. All the numbers were based on data that was found in these papers and represent the most accurate information that I could find. Most of the information about the war were published within a month after the war ended. I was looking for information about the number of female casualties. If you need to do extensive research in this area for your report. I strongly suggest to goto the local Library and check the Special Edition of Time, US News and Reports, Newsweek that was published around the first week of March 1991. You'll find that these publications will carry detailed information on why the military coalition was able to defeat the Iraq's Republican Guards. Where is the Gulf War memorial from? The photos on the website are from Arlington National Cemetery. These were taken in December, 1995. I took the pictures of the grave stone for no particular reason. I don't personally know the name of the person who appears on the gravestone. 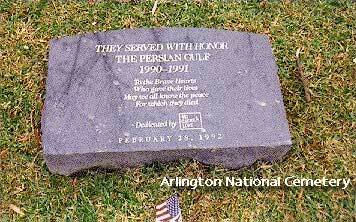 The monument photo is the only monument in Washington DC for those that died in the Gulf War. If you plan to visit Washington DC and would like to additional information on where this is, please send me an email and I'll give you directions. Did you serve in the War? I get an email once a day asking for the real reason we went to Iraq. While I am not a Military expert, I can offer my option on the subject based on the knowledge and the feedback that I have received from this website. The reason we went to war against IRAQ was basically oil control. That's the short answer. I could go into extensive detail but it really isn't worth it. However, the Federal Government will only publicly admit that the reason we became involve was to prevent additional aggression. I think there's just too much evidence to suggest that the war was over oil control. Last modified: November 30, 2018 11:28 am.